The Dutch East India Trading Company first brought tea from China to the Netherlands in the late 1500s, and it soon spread all over Europe. Tea immediately became popular with the aristocracy, but its price tag kept it beyond the reach of lower classes until the 1700s. Dutch doctors touted its curative powers, while German and French doctors warned of its harmful effects. By 1750, tea had come to America, to the Dutch colony of New Amsterdam. Tea’s acceptance in England and Scotland took longer. It was condemned, with naysayers waging a moral campaign against it, calling it harmful and morally corrupting. In 1662, Charles II married Catherine of Portugal, a tea-drinker, and, always quick to get on the side of the crown, the English aristocracy succumbed to tea. Despite the clergy’s objections, tea’s popularity grew so strong that alcohol consumption declined. The social practice of afternoon tea was well in place in Britain’s New England colonies, long before the English picked up the habit. Diaries from Maine in the late 1700s contain many references to tea in the afternoon, served with pie or cake, but it was not until 1840 that Anna Stanhope, Duchess of Bedford, introduced tea as an afternoon snack and social event in England. 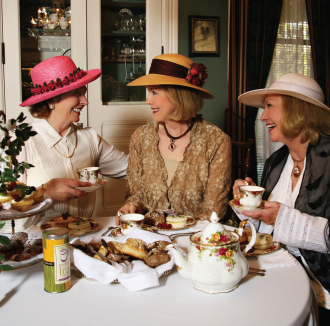 Teatime became a ritual that many in Britain still follow today, while in America, tea parties are an echo of the past. © 2008-2010 This article originally appeared in the Winter 2008 issue of Texoma Living! Magazine. Photo by Anne-Marie Shumate for Lasting Images Photography.